Gears of Halo - Video game reviews, news and cosplay : Who are The Reapers in Mass Effect? Reapers are a hyper-advanced machine race and the creators of mass relays and the Citadel, resembling the species that their initial genetic material has been taken from, that periodically awaken to destroy all advanced organic life in the galaxy and are the primary antagonists of the Mass Effect trilogy. The term "Reaper" is not actually a self-designation. The Reapers, known by the Geth as the Old Machines, are a highly advanced machine race of synthetic/organic starships. The Reapers reside in dark space, the empty, starless space between galaxies. They hibernate there, dormant for thousands of years, before they are given the signal to return. Their origins are completely unknown. According to Sovereign, a Reaper vanguard left behind to ensure the Reapers' return, it is a Prothean name given to them, stating they have no name and that they "simply are". However, it is revealed by the character Legion in Mass Effect 2 that Sovereign referred to itself as Nazara and that the Reapers are known as the "old machines" among the Geth. The Reapers hibernate in the dark space that lies beyond the galaxy's outer rim, and the Citadel itself is a gigantic mass relay that allows them to return to the galaxy at their leisure. The Citadel's location at the mass relay network hub, along with its formidable defences, make it a seemingly ideal location for the capital of galactic civilization. For reasons currently unknown, the Reapers cull the intelligent races of the Milky Way galaxy, returning to dark space with the organics' technology and resources. The Reapers leave no evidence of their conquest, nor of their existence – only desolate, barren ruins of those who came before. 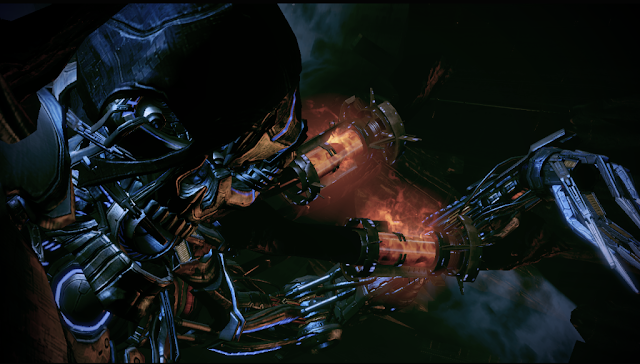 However, based on the events of Mass Effect 2, it is possible that the Reapers use enslaved organic beings in order to create more of their own kind, as seen with the Human-Reaper. 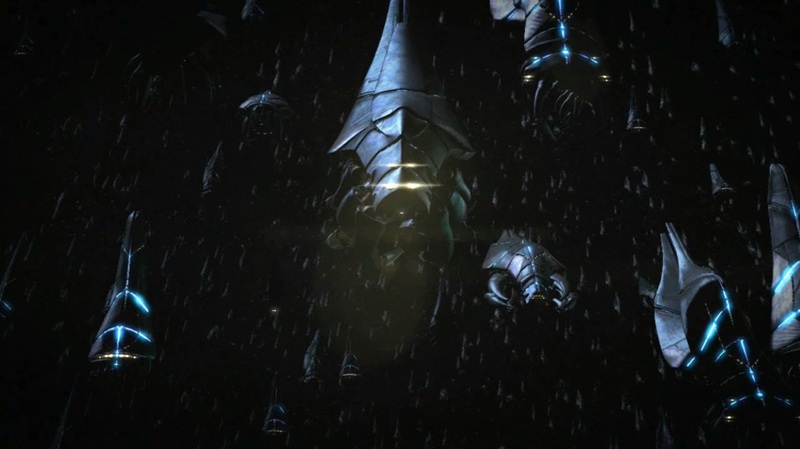 Upon the Citadel's activation however, the Reapers quickly attack the Citadel and seize control of the mass relays, decapitating the government command structure and isolating individual systems. With any advanced organic civilizations in disarray, the Reapers then proceed with their genocide by methodically invading each system, exterminating or enslaving populations as they advance. This cycle of destruction has been repeated every 50,000 years for at least 37 million years; however, the Reapers have no known motive for this act beyond it being for reasons organic minds cannot comprehend. The primary plot of the game involves a race against time to prevent the Reapers' return. In Mass Effect, it is at first believed that Sovereign is simply a massive dreadnought of unknown origin about two kilometers long (the largest warship class within game canon is standardized at one kilometer) controlled by rogue Spectre Saren Arterius. Later, Sovereign reveals itself to actually be a huge sentient ship, a Reaper, and the true power behind Saren. Reapers generate an "indoctrination" field, an array of signals that progressively and permanently damage higher-order functions in organic brains. Sovereign uses this method to exert influence over its organic charges, to varying degrees (total mind control on one end, suggestion on the other), including Saren Arterius. Sovereign's design resembles a squid, with a long round hull strong enough to take no noticeable damage when it rammed into a frigate-class vessel, and large multi-jointed limbs equipped with powerful weapons. In conversation with Commander Shepard, Sovereign claims that the Reaper race is "infinite"; has "always existed"; and has no creators. Being a mechanical race, these claims are irrational, but still Reaper psyche is logically bound. (It is possible that the Reapers were once organic and merged themselves with machines.) These claims show that Sovereign believes in non-rational concepts akin to religious beliefs, though in the case of the Reapers, the beliefs of Sovereign seem megalomaniacal. In Mass Effect 2 , a Reaper named Harbinger directs the Collectors to capture entire human colonies. The genetic material (liquefied human bodies) from the captured colonists is used to create a human-based Reaper. It is made clear in Mass Effect 2 that Reapers are modelled after the organic race that constitutes a Reaper's organic components. In the subsequent conversation that follows the revelation of the existence of a human-Reaper "larva", it is implied that the harvesting and cyclical exterminations of all sapient life committed by the Reapers is part of a "reproductive process" whereby the Reapers acquire material needed to create new Reapers. The character Legion describes a Reaper as "one ship, one will, many minds", insinuating the minds of the organics used in a Reaper's construction are still active in their new form, though it may also suggest a geth-like collection of programs. At the end of Mass Effect 2, Harbinger is seen activating the dormant Reaper fleet, showing a few hundred others which share Sovereign's basic cuttlefish-like appearance. The fleet, presumably numbering in the hundreds or thousands (although only between two and three hundred are shown in a brief scene involving Harbinger and the Reapers awakening), appears to be moving towards the Milky Way, thus setting the stage for Mass Effect 3. It has been confirmed that the Reapers will, in Mass Effect 3, attack Earth, as was previously speculated by Shepard and others. Sovereign, the first Reaper encountered, bore a superficial resemblance to a reaper cuttlefish, with a bulky semi-cylindrical body, a tapering plate over the rear and a mass of metallic "tentacles" extending from its front end, in addition to six jointed legs extending from its body. When the Reaper fleet is revealed in dark space they are all shown with this basic design. However, one Reaper in the foreground shown when Harbinger awakens the fleet seems to resemble a scarab beetle but with great diversity in tentacle number, shape, and orientation, some with extended heads and others (particularly Harbinger) having multiple glowing eyes. This diversity is presumably due to the Reapers' reproduction method, in which vast numbers of a single species are harvested, melted down into a raw genetic paste, and then used to construct a "larva" that takes on the characteristics of the species from which it was created. However, as of the end of Mass Effect 2, it is unclear whether every new Reaper derived from organics will eventually take on the cuttlefish-like shape of Sovereign, Harbinger, and others like them, or if the majority of the Reaper fleet is derived from a long-extinct species of organics whose physical forms they now imitate. Sovereign's design appears to have influenced the 'heretic' geth. This is not surprising, as these geth worship the Reapers as "gods", considering them to be the epitome of independent AI. Wherever the heretic geth become entrenched they build monuments to the Reapers resembling Sovereign's 'tentacles' around a glowing orb, and genuflect. Sovereign was apparently insulted by the adoration of such simple, base synthetics, but it did see their value as pawns and possible replacements for the flawed and organic keepers. Reapers and their technology have a strange effect on organic beings. Both Dr. Shu Qian and Edan Had'dah begin acting oddly after coming into contact with the "artifact" they found. This mental manipulation is known as indoctrination. Put simply, any organic being who is in close proximity to a Reaper for too long comes to believe the Reapers are correct in their goals and will do anything to serve them. Gradually the mind is eroded until the individual becomes a mindless slave no longer capable of independent thought. Sovereign could partly control the rate of this process as seen with Saren; in order for him to serve the Reaper efficiently, Saren needed a measure of free will. This eventually convinced him that the only way to preserve organic life was to submit to the Reapers provided they could prove themselves useful. Only beings of immense mental strength, such as Asari matriarchs, can resist indoctrination, and even then, their resistance only lasts a short time and only forestalls the inevitable. Matriarch Benezia chose to die rather than risk falling under indoctrination again, and when Saren finally rebels against Sovereign, he kills himself to prevent doing any further damage to the galaxy. This indoctrination is permanent (with the single possible exception of Shiala) and is one of the most insidious weapons of the Reapers. Even more horrifying is that the indoctrination field remains active even if the Reaper is largely disabled and incapable of action. A Cerberus science team was indoctrinated by being inside a Reaper that had otherwise been floating derelict for 37 million years, its only obvious activity being mass effect field generation. Even without their indoctrinating influence, Reapers are immensely powerful warships and their technology is devastating. Sovereign’s destructive power was unrivalledd in the known galaxy. Each of the "tentacles" extending from its bow was equipped with a powerful "magnetohydrodynamic" weapon which ejects a stream of molten metal at a fraction of the speed of light which could tear through a cruiser in a single sustained burst. Its gigantic spinal-mounted gun was able to rip through the hulls of even the largest of dreadnought-class ships with ease, effortlessly penetrating their kinetic shields. However, the Reapers are not invincible. When the Reapers go into states of hibernation between cycles, they are vulnerable. By taking refuge in dark space, the Reapers ensure they will not be discovered by accident and destroyed while they wait for their vanguard to open the Citadel mass relay. A concentrated effort by the fleets of organic races could also destroy a Reaper even if it is at full power, and a single ship managed to destroy Sovereign when its shields and weapons were disabled. Even without their indoctrinating influence, Reapers are immensely powerful warships and their technology is devastating. Sovereign’s destructive power was unrivaled in the known galaxy. Each of the "tentacles" extending from its bow was equipped with a powerful "magnetohydrodynamic" weapon which ejects a stream of molten metal at a fraction of the speed of light which could tear through a cruiser in a single sustained burst. After the last cycle, which obliterated the Prothean empire, a cadre of elite Prothean scientists hidden on Ilos survived the genocide. It took them decades to realize the connection between the Reapers, the Citadel, and the keepers, but this discovery gave them the key to breaking the cycle forever. At the time, the Protheans were the only spacefaring race advanced enough to attract the attention of the Reapers, and had set about attempting to preserve the sentient races they saw evolving on other planets, including the hanar and humans. The Protheans developed a plan to forestall the impending Reaper attack for future generations of sapient, spacefaring species. This plan hinged on the fact that the keepers have evolved, and now only respond to signals from the Citadel itself. As stated above, the Reaper vanguard signals the Citadel which in turn signals the keepers to open the mass relay, ushering in the next Reaper invasion. However, the Prothean scientists used a reverse-engineered prototype mass relay—the Conduit—travelled to the Citadel, and altered the Citadel signal. When Sovereign decided it was time to begin the cycle again, the keepers ignored the order. This greatly complicated matters for Sovereign. In order to unleash its brethren from dark space, it would have to find a way to manually activate the relay from inside the Citadel. While Reapers are undoubtedly beings of terrible power and ferocity, a single Reaper would not be able to survive the combined might of the assembled Citadel races in a direct assault. It needed to find an agent that would lead it to the Conduit. This agent was Saren, who became capable of comprehending the vision from the Prothean Beacon. With a fleet of geth ships, the Reaper launched an all-out assault on the Citadel, nearly devastating the entire fleet. After Commander Shepard defeated Saren and Sovereign, the Collectors began attacking human colonies and abducting their populations. Cerberus determined that the Reapers were behind this and planned to have Shepard thwart this latest Reaper threat to humanity. Over time, Shepard uncovered disturbing facts regarding the nature of the Reaper connection to the Collectors. Apparently, because humanity is a race of great genetic diversity and was the race who defeated Sovereign, it was enough to gather the Reapers' attention. It is revealed that the Collectors were originally Protheans who were captured by the Reapers and genetically re-purposed to suit their needs. The Collectors were working under the direct supervision of the Reaper Harbinger, who ordered the Collectors to abduct humans in the Terminus Systems. The captured humans were taken to the Collector Base and processed into organic matter to construct a new Reaper modeled on the human form. EDI speculated that this was the Reaper equivalent of reproduction. When discovered by Shepard, the incomplete Human-Reaper was composed of facsimiles of the skull, arms and ribcage of a human with its lower spine and torso still under construction. EDI concluded that tens of thousands of humans had already been processed. Shepard was able to stop the process and destroy the Human-Reaper. With the Human-Reaper destroyed and the Collectors defeated, the Reapers lost any chance of using the Citadel mass relay to quickly return to the Milky Way Galaxy. Harbinger and the rest of the Reapers awoke from hibernation, and began the long journey towards the Milky Way, setting the stage for Mass Effect 3.